APPEAL� OIL-BASED STAINLESS STEEL POLISH AND CLEANER, CLEAR, LEMON SCENT, 20 OZ. APPEAL� OIL-BASED STAINLESS STEEL POLISH AND CLEANER, CLEAR, LEMON SCENT, 20 OZ. Formulated with a blend of cleaning solvents and fine oils for a superior cleaning job on stainless steel. Cleans, polishes and protects stainless steel surfaces without hard rubbing and does not leave an oily residue. With regular care this product can help prolong the factory finish. Resists fingerprints, grease and water spatter. 20 Oz. can size, 15 Oz. fill weight, clear color, lemon scent. Household Style Ready For General Use. . Gallon. Safe for all septic systems. Universal 3.35" core. Tissue Type: Bath JRT Jr. Roll; Number of Plies: 2; Length: 525'; Width: 3 21/50". APPEAL� WATER-BASED STAINLESS STEEL POLISH AND CLEANER, MILKY WHITE, LEMON SCENT, 20 OZ. APPEAL� WATER-BASED STAINLESS STEEL POLISH AND CLEANER, MILKY WHITE, LEMON SCENT, 20 OZ. Cleans, polishes and protects stainless steel surfaces without hard rubbing and does not leave an oily residue. With regular care this product can help prolong the factory finish. Resists fingerprints, grease and water spatter. 20 Oz. can size, 16 Oz. fill weight, milky white color, lemon scent..
RENOWN� SUREBLEND LAVENDER BREEZE AIR FRESHENER, 80 OZ. 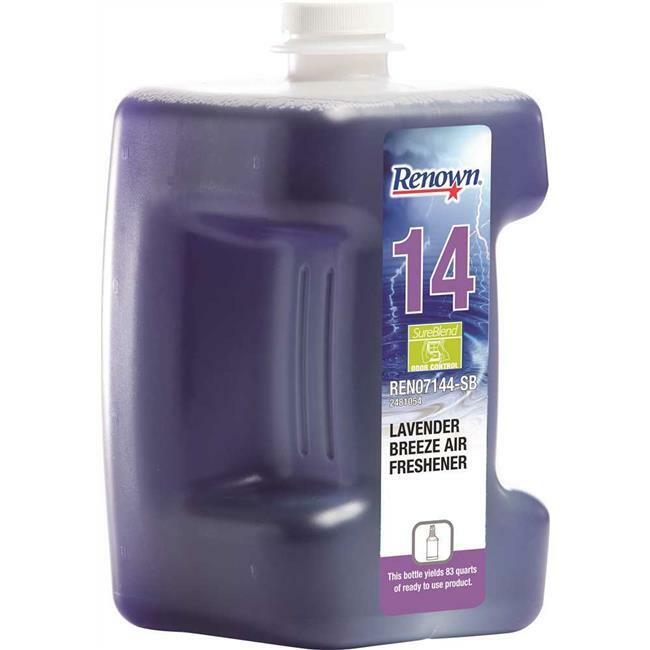 RENOWN� SUREBLEND LAVENDER BREEZE AIR FRESHENER, 80 OZ. RENOWN� SUREBLEND SUPER DUTY CLEANER AND DEGREASER, 80 OZ. RENOWN� SUREBLEND SUPER DUTY CLEANER AND DEGREASER, 80 OZ. Formulated using MicroEmulsion 3G Technology. Super Duty Degreaser is a low toxicity, low VOC, readily biodegradable, micro-emulsion, highly concentrated cleaner/degreaser that is specially designed to address the environmental, safety and health concerns facing today's housekeeping professional. The formulated blend of ingredients combine to lift and emulsify soils, fats, oils and greases without the use of solvents. Can be used to clean most hard surfaces such as walls, tile & grout, food processing and service areas. 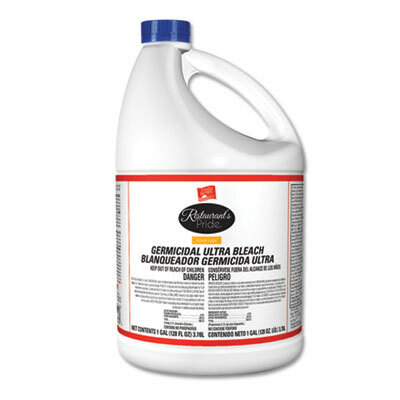 Ultra germicidal bleach cleans, deodorizes and disinfects. 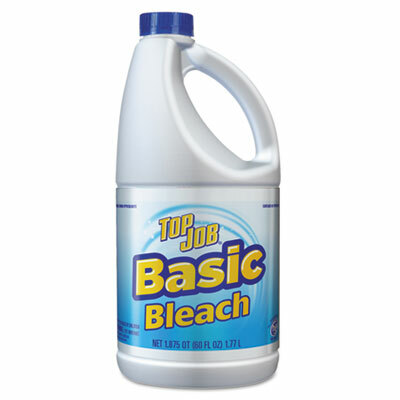 Removes tough stains and whitens clothes. Hospital-grade disinfectant kills a broad spectrum of microorganisms, including staph and strep bacteria, MRSA and E. coli. Application: Bleach; Applicable Material: Ceramics; Cement/Concrete; Enamel; Fabric; Glass; Laminate; Metal; Plastic; Chemical Compound: NaOcl; Dirt Types: Bacteria; Organic Matter; Stains. RENOWN� SUREBLEND ENZYME ENRICHED FLOOR CLEANER AND DEODORIZER, 80 OZ. RENOWN� SUREBLEND ENZYME ENRICHED FLOOR CLEANER AND DEODORIZER, 80 OZ. This product is a high performance, bacterial-enriched floor cleaner, odor eliminator, and grease digester with a very pleasant potpourri scent. It is recommended for use in food service areas, schools, hotels, hospitals, restrooms, and shower rooms. No rinse is required. The unique chemistry provides bleaching action that brightens surfaces as it cleans and leaves surfaces sparkling clean with a pleasant scent. It is ideal for cleaning concrete, ceramic tile, quarry tile, grout, brick and rubber mats with floor machine or mopping. Inherent biological action continues to clean between regularly scheduled cleanings to help keep grease accumulations to minimum. RENOWN� SUREBLEND NEUTRAL DISINFECTANT, 80 OZ. 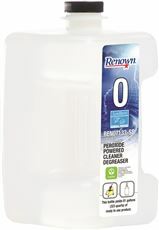 RENOWN� SUREBLEND NEUTRAL DISINFECTANT, 80 OZ. This product is for use on hard, non-porous inanimate surfaces in: Hospitals, medical and dental offices and clinics, healthcare facilities, nursing homes. Day care centers and nurseries, kindergartens, and preschools. Restaurants and bars, kitchens, cafeterias, fast food operations. Supermarkets, convenience stores, retail and wholesale establishments. Institutional facilities, laboratories, factories, business and office buildings, restrooms, hotels and motels. Schools, colleges, churches, athletic facilities and locker rooms, exercise facilities, gymnasiums. This product is formulated for use on hard, non-porous inanimate surfaces such as: Counters, stovetops, sinks bathroom/kitchen. Tanning spas/beds, tanning equipment. Shower stalls, shower doors and curtains, bathtubs and glazed tiles, toilets, urinals. Tables, chairs, desks, workstations, washable walls, cabinets, doorknobs. 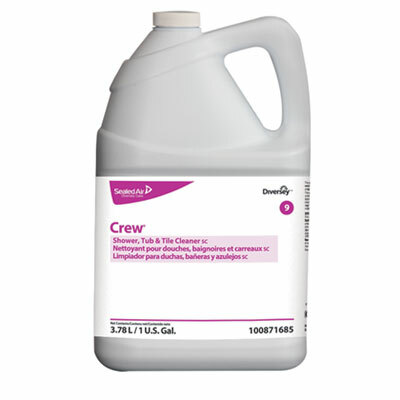 This product is designed for use on the following hard, non-porous environmental surfaces: vinyl, painted surfaces, plastic surfaces, glazed ceramic, glazed porcelain, chrome, stainless steel, aluminum, laminated surfaces and baked enamel surfaces associated with floors, walls, ceilings, - any washable food and non-food contact surface where disinfection is required. This product's non-dulling formula eliminates the time and labor normally required for rinsing. A potable water rinse is required for food contact surfaces. Do not use on glasses, dishes, utensils or interior surfaces of appliances. Shark SaniFiber 12-count Disposable Pads for use with SK460. This item cannot be shipped to APO/FPO addresses. Please accept our apologies. 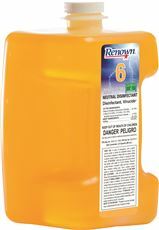 RENOWN� SUREBLEND PEROXIDE POWERED CLEANER AND DEGREASER, 80 OZ. RENOWN� SUREBLEND PEROXIDE POWERED CLEANER AND DEGREASER, 80 OZ. A low toxicity, low VOC, readily biodegradable, hydrogen peroxide fortified, highly concentrated all-purpose cleaner that is specially designed to address the environmental, safety and health concerns facing today housekeeping professional. The hydrogen peroxide oxidizes the soil and stains, destroys odors and provides color safe bleaching action. Can be used to clean most surfaces such as windows, walls, floors, tile and grout, washroom fixtures, tubs, showers, toilet bowls and urinals. No rinse required. 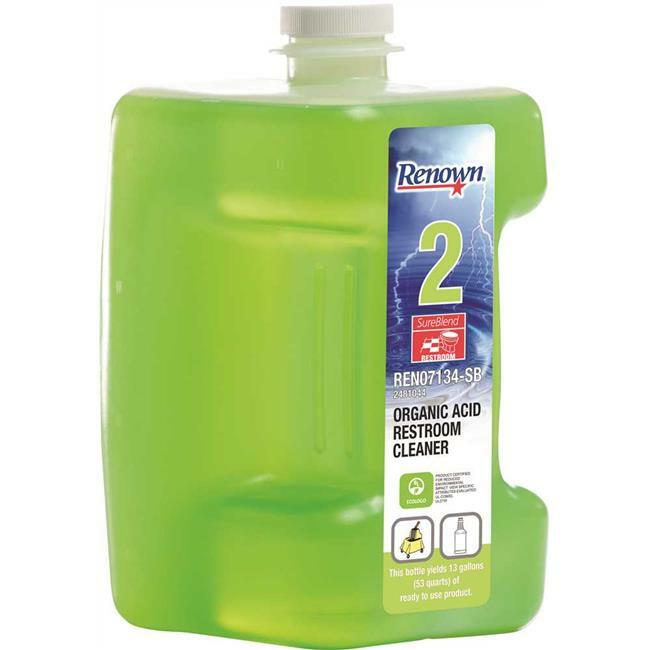 RENOWN� SUREBLEND NON-ACID RESTROOM & BOWL CLEANER AND DISINFECTANT, 80 OZ. RENOWN� SUREBLEND NON-ACID RESTROOM & BOWL CLEANER AND DISINFECTANT, 80 OZ. For use in: Hospitals, nursing homes, medical and dental offices and clinics, physician offices. Day care centers and nurseries, sick rooms, elder care centers. Institutional facilities, business and office buildings, hotels and motels and transportation terminals, apartments. Institutions, schools and colleges, churches, classrooms, community colleges, universities, athletic facilities and locker rooms, exercise rooms, exercise facilities, gyms. 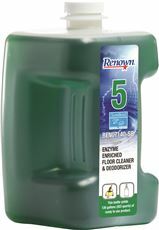 This product may be used on washable hard, non-porous surfaces such as: Shower stalls, shower doors and curtains, bathtubs and glazed tiles, chrome plated intakes, toilets, toilet seats, toilet bowls, toilet bowl surfaces, urinals, portable and chemical toilets and latrine buckets, vanity tops, and restroom fixtures, bathroom fixtures, bathroom bowls, basins, tubs. 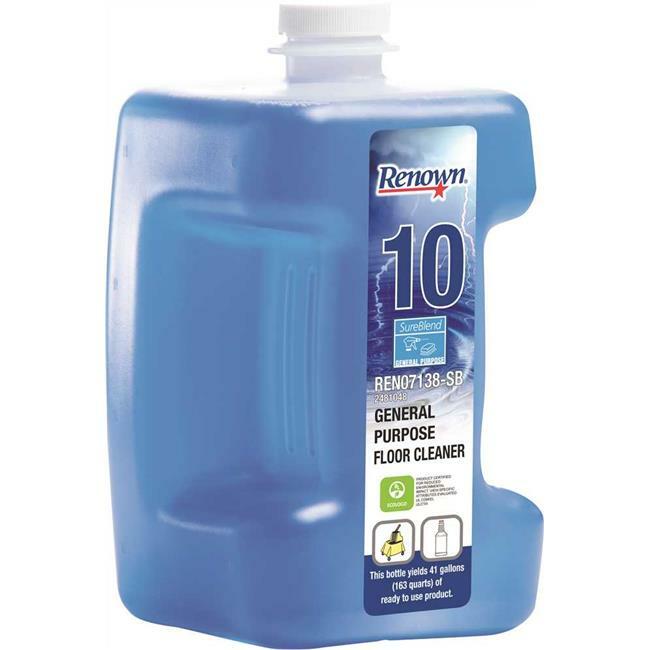 RENOWN� SUREBLEND NEUTRAL FLOOR CLEANER, 80 OZ. 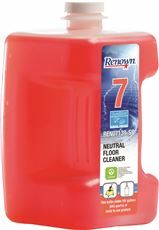 RENOWN� SUREBLEND NEUTRAL FLOOR CLEANER, 80 OZ. Fast cleaning of most washable surfaces. Removes stubborn soils such as grease, crayons, pencil and heel marks. Works on countertops, sinks, walls, ceramic tiles, floors and bathtubs. Pleasant fragrance. 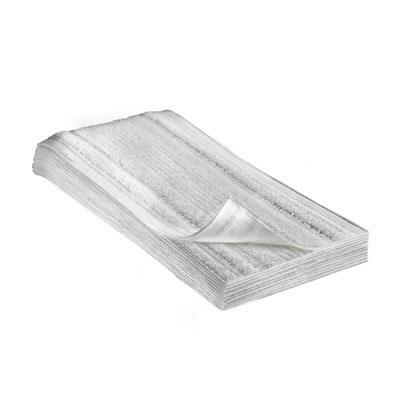 Application: All-Purpose; Applicable Material: Ceramic; Chrome; Fabric; Fiberglass; Metal; Porcelain; Plastic; Stainless Steel; Wood; Chemical Compound: D-glucopyranoside, C9-11 alkyl, oligomer; Dirt Types: Crayon; Fingerprints; Grease; Grime; Oil; Organic Matter; Pencil; Smoke Film. 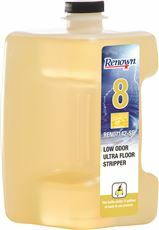 RENOWN� SUREBLEND LOW ODOR ULTRA FLOOR STRIPPER, 80 OZ. RENOWN� SUREBLEND LOW ODOR ULTRA FLOOR STRIPPER, 80 OZ. A low odor, ultra-concentrated (1:20), high-powered stripper that rapidly penetrates and strips off floor finish. A powerful solvent combined with amines, penetrates and removes multiple coats of floor finish with minimum labor. This low odor formula is ideal for use in areas where odors are a concern. This high productivity floor stripper removes floor finishes completely with one pass and requires no neutralizer. This unique formula provides the lowest end-use cost per gallon due to its ultra-concentration. 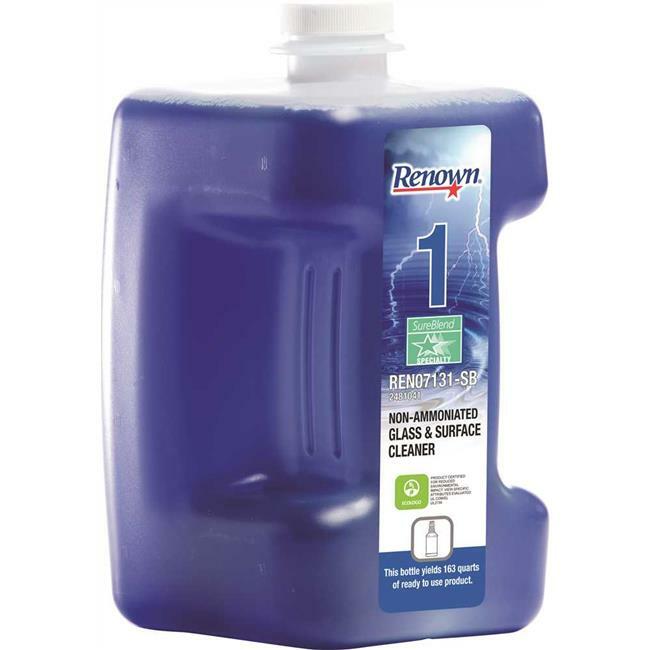 RENOWN� SUREBLEND NON AMMONIATED GLASS CLEANER, 80 OZ. RENOWN� SUREBLEND NON AMMONIATED GLASS CLEANER, 80 OZ. An ultra-concentrated, Ammonia-free, non-streaking, non-smearing, quick drying product that cleans and shines glass, mirrors, sinks, countertops, stainless steel, and other washable surfaces. Can also be used as a light-duty cleaner on all surfaces not harmed by water. APPEAL� DUST MOP/CLOTH TREATMENT, YELLOW, MILD SCENT, 20 OZ. APPEAL� DUST MOP/CLOTH TREATMENT, YELLOW, MILD SCENT, 20 OZ. 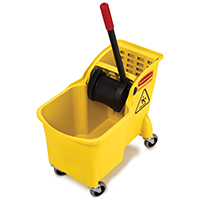 This effective dust mop/cloth treatment traps and holds dust and dirt until released with a quick shake. Leaves no oily residue. For gym, resilient, concrete and terrazzo floors. 20 Oz. can, 17 Oz. fill weight, clear yellow color, clean mild scent. 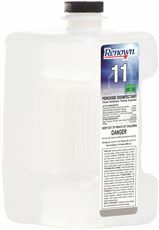 RENOWN� SUREBLEND PEROXIDE DISINFECTANT, 80 OZ. 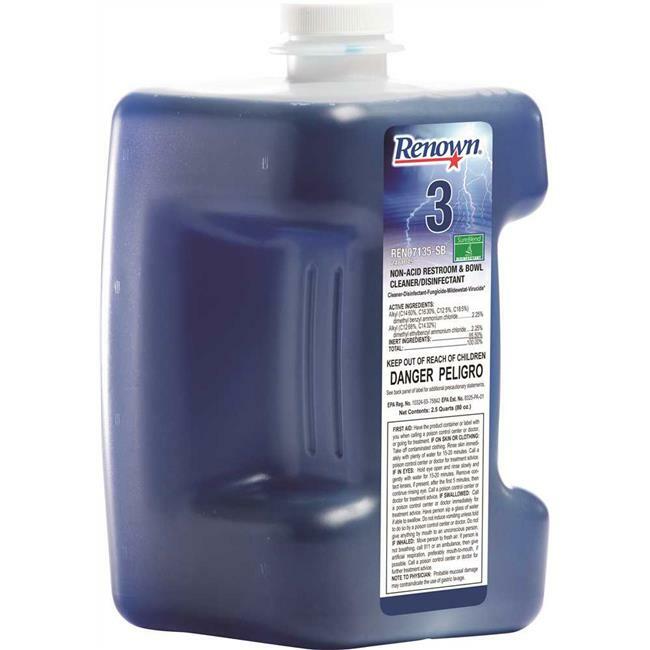 RENOWN� SUREBLEND PEROXIDE DISINFECTANT, 80 OZ. 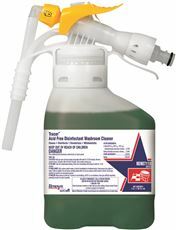 This product can be used to disinfect the following areas: Bathrooms, Kitchens, Day Care Centers, Nurseries, Athletic Facilities, Office Buildings, Colleges, Dressing Rooms, Exercise Facilities, Health Clubs, restaurants, Hotels, Motels, Institutional Facilities, Locker Rooms, Public Restrooms, Retail facilities, Schools, Showers and Bath areas, Universities. This product can be used in the following hospital/healthcare settings: Dental Offices, Health Care Facilities, Hospitals, Medical Offices, Nursing Homes. Next generation ready-to-use disinfectant cleaner formulated with patented hydrogen peroxide technology (AHP�) to deliver fast, effective cleaning performance. Contains no phosphates, quat or phenols. 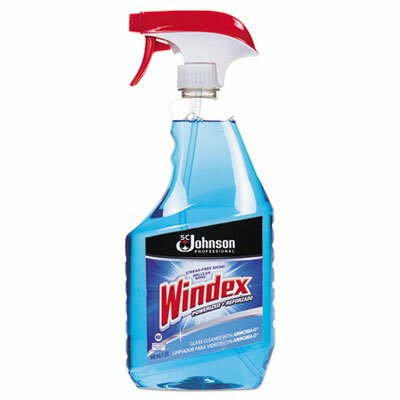 Cleans, disinfects and deodorizes in one labor-saving step. It is a one minute bactericidal, fungicidal, tuberculocidal and 10 sec non-food contact sanitizer. 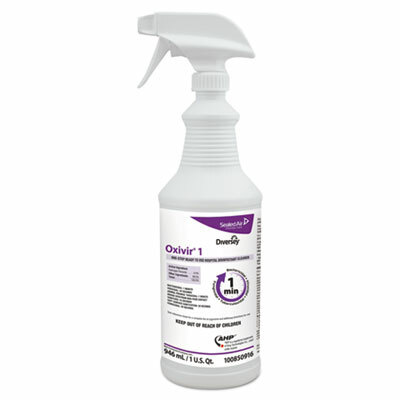 Disinfects viruses and is a soft surface sanitizer, both in 30 seconds. Kills MRSA, Norovirus, RSV and Adenovirus. Meets bloodborne pathogen standards for decontaminating surfaces soiled with blood and body fluids. 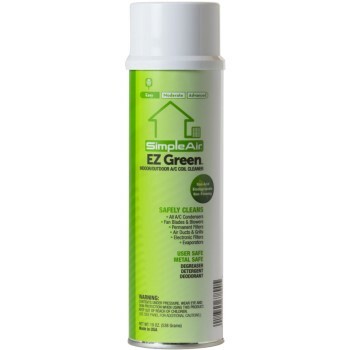 Destroys allergens and kills germs, while cleaning hard, nonporous surfaces; removes allergens like pet dander, cockroach matter, dust mite debris, and pollen particles. One-step cleaner, disinfectant, and deodorizer on hard, nonporous surfaces with no rinsing required. Harnesses the cleaning power of hydrogen peroxide; specially designed to penetrate the toughest soils. Suitable for everyday use; compatible with virtually all surfaces (avoid contact with brass and copper). Application: Disinfectant/Cleaner; Applicable Material: Hard, Non-Porous Surfaces; Chemical Compound: Benzyl Alcohol; Dirt Types: Bacteria; Fungus; Viruses. APPEAL� BASEBOARD CLEANER AND WAX STRIPPER, PALE BEIGE, PINE SCENT, 20 OZ. APPEAL� BASEBOARD CLEANER AND WAX STRIPPER, PALE BEIGE, PINE SCENT, 20 OZ. This heavy duty foaming product is designed to remove wax build up in hard to reach areas such as floors, baseboards and ceramic wall tile. The thick, penetrating foam clings to vertical surfaces and quickly emulsifies by chemical action leaving a wax free surface. 20 Oz. can, 19 Oz. fill weight, pale beige color, pine scent. RENOWN� SUREBLEND ORGANIC ACID RESTROOM CLEANER, 80 OZ. RENOWN� SUREBLEND ORGANIC ACID RESTROOM CLEANER, 80 OZ. A concentrated, organic acid fortified, heavy-duty multi-purpose bathroom cleaner that is specially designed to address the environmental, safety and health concerns facing today's housekeeping professional. Readily biodegradable, this product will not accumulate in the environment and will not contribute to waste treatment plant sludge. Cleans away soap scum, mold & mildew stains, hard water deposits, rust stains, body oils, fats and dirt. Can be used to clean most surfaces such as windows, walls, floors, washroom fixtures, tubs, showers, toilet bowls and urinals. Especially effective on removing difficult stains from ceramic tile floors and grouting. RENOWN� SUREBLEND GENERAL PURPOSE FLOOR CLEANER, 80 OZ. RENOWN� SUREBLEND GENERAL PURPOSE FLOOR CLEANER, 80 OZ. 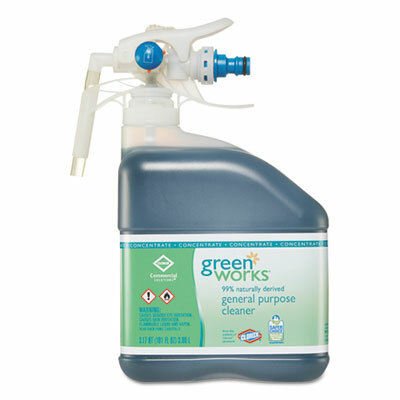 A readily biodegradable, very low toxicity and VOCs, environmentally responsible general purpose cleaner. Safely and thoroughly performs all cleaning applications including removal of heavy grease and soil. This moderate foam formula leaves a clean, film free surface, making it the ideal product for scrubbing and recoating without the use of harmful chemicals, such as: phosphates (promote algae blooms), EDTA (carcinogen) and NPE (harmful biodegradable intermediate). 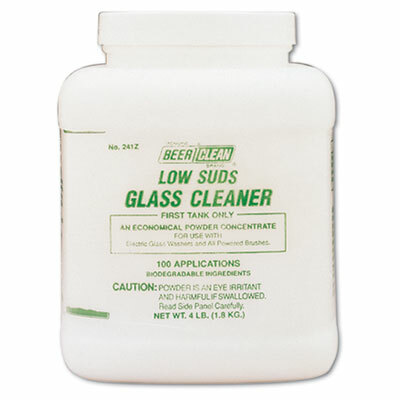 When used as directed, this general purpose cleaner aggressively removes embedded soils and scuffs in the top layers of floor finish, and prepares the surface for re-coating with minimal rinsing required. General purpose household bleach may be used for a variety of cleaning tasks. When used with your favorite laundry detergent, it effectively removes stains and brightens whites. Chlorine-based formula disinfects and deodorizes brick, ceramics, cement, concrete, fabrics and more. Application: Bleach; Applicable Material: Ceramics; Cement/Concrete; Enamel; Fabric; Glass; Laminate; Metal; Plastic; Dirt Types: Bacteria; Fungus; Grease; Mildew; Organic Matter; Soil; Stains; Scent: Regular. Powerful shower room cleaner helps reduce labor by requiring less scrubbing than non-acidic alternatives. Washes away soap scum, while brightening stainless steel and ceramic tiles. Value-centric concentrate helps you save money as well as allows you to mix the product for task-specific projects. Leaves a pleasant, fresh scent after use. 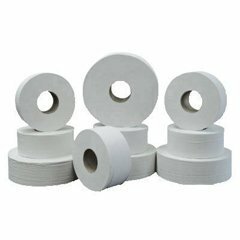 Application: Bathtubs; Floors; Showers; Urinals; Walls; Applicable Material: Ceramic; Fiberglass; Grout; Metal; Plastic; Chemical Compound: Urea Hydrochloride; Dirt Types: Dirt; Grease; Mildew; Mineral Scale; Mold; Oil; Soap Scum. Fast, easy cleaning with Ammonia-D�. Won't streak or leave a film. 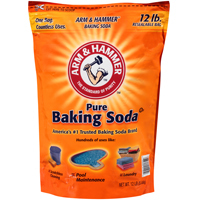 Also cleans chrome, stainless steel, Plexiglas� and other hard surfaces. Application: Glass Cleaner; Applicable Material: Ceramics; Enamel; Fiberglass; Glass; Laminates; Metal; Plastic; Vinyl; Chemical Compound: Ammonia-D�; Dirt Types: Body Oils; Dust; Fingerprints; Grease; Grime; Smudges; Water-Based Soil. Combines powerful cleaning performance with naturally derived and plant-based ingredients to safely tackle messes throughout the workplace. 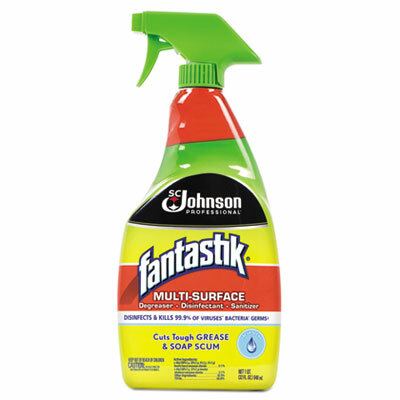 This all-purpose cleaner cuts through grease, grime and dirt with ease without any harsh chemical fumes or residue. It�s suitable for use on a variety of surfaces including counters, appliances, stainless steel, sealed granite, chrome, sinks and toilets, making it ideal for use in commercial kitchens, schools, offices, day care centers and other business facilities. Application: All-Purpose; Applicable Material: Ceramic; Fiberglass; Glass; Laminates; Metal; Plastic; Sealed Cement; Sealed Stone; Vinyl; Chemical Compound: Alkyl Polyglucoside; Citric Acid; Corn-Based Ethanol; Glycerin; Dirt Types: Dust; Grease; Grime; Oil; Soil.